Around 7,000 of these students looked at ATLAS data, using modified versions of the ATLAS event visualisation software, Atlantis, to identify particles. They followed one of two programmes: the “W-path” (developed by TU Dresden, Germany) or the “Z-path” (developed by the University of Oslo, Norway). By going through an analysis for themselves, students learn how a scientific discovery can be claimed. For the W-path, students searched the data for events where a W boson had been produced and then decayed to an electron or muon, and a neutrino. By measuring the ratio of the number of positively to negatively charged W bosons, students were able to probe the structure of the proton and learn about its constituents. Hidden in the data were a few events identified by ATLAS physicists as containing Higgs bosons decaying to pairs of W bosons, and the students were asked to try and find these too. Students following the Z-path searched for pairs of electrons or muons and calculated their invariant mass. By plotting the masses of all of the pairs, students were able to identify several different particles: the J/ψ meson, the Υ meson and the Z boson. A handful of simulated “new physics” events were also included that contained “Z prime” bosons, a heavy partner of the Z boson predicted by many new theories. At the end of the day, students joined a video conference hosted by LHC researchers to share their findings and combine their results with another four or five institutes from around the world. 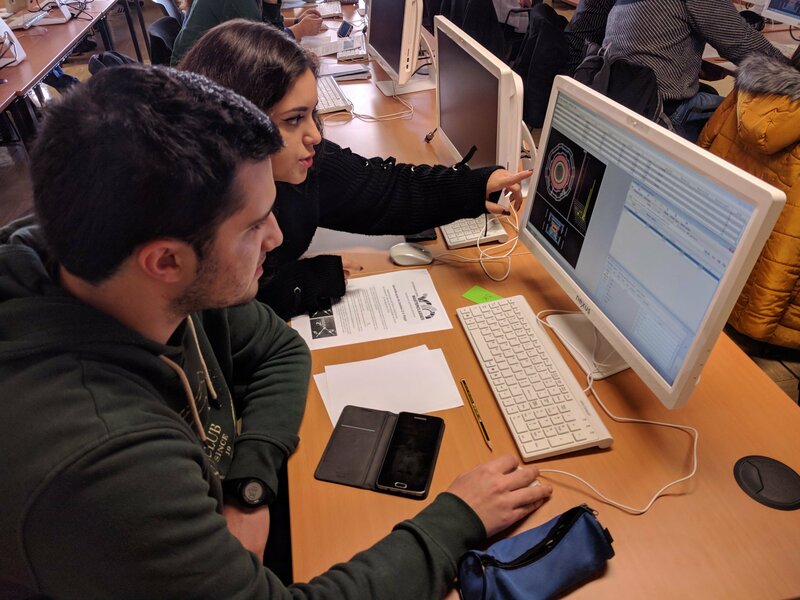 The students got a taste of how physicists work together internationally and experienced the benefits of combining results from different sources. They were also able to compare their measurement to the published ATLAS result and the theoretical prediction. Although the 2018 masterclass programme has come to an end, students and teachers worldwide are encouraged to look ahead to next year. Visit the International Masterclasses website to connect with local physicists and institutes collaborating with the programme.